Nearly twelve years ago, as I was preparing applications to doctoral programs in theology, I felt a stirring in my heart that led me to make an inquiry into a Jesuit vocation. I had known the Jesuits as teachers and mentors and while I had given fleeting thought to becoming a Jesuit, I had never pursued it with much energy. 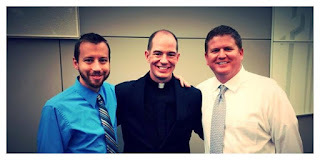 It was a mid-September day that I went to see the vocation director who was staying at Saint Ignatius High School. We had a nice meeting and I left interested but with no more clarity about whether I wanted to be a Jesuit. He had told me a great deal about the Society and the process of becoming a Jesuit, but I didn't necessarily feel any more moved to want to become one. Until, that is, I got to my car. I had no sooner put the key into the ignition than a Jesuit I knew from when I was in high school walked past my car. He didn't see me but I had a clear sight of him and there was no mistaking it: he was happy. This aroused within me the greatest sense of curiosity: what was it that made this man so joyful? Could I attain a share in this joy? "Let the Holy Spirit provoke curiosity" in onlookers who see Christians serving the poor, the elderly, the sick, the helpless, he said. Let the onlookers wonder: "Why are they doing this?" "Are they crazy?" Let them wonder why Christians spend their lives on the very people others have thrown away, he said. Too often, I reckon, we mistake the "Faith" for a crystallized set of beliefs, an intricate and byzantine assembly of propositions that tell us what we believe. We forget that Faith is a gift, a response to God's invitation to be friends. We enact our faith in service to our sisters and brothers not because we are forced at gunpoint but, rather, because our service flows from our love. We rush to the margins not with grimaces and scowls but with a sense of joy that we are responding to the One who calls us. Evoking the image of the Good Shepherd, Pope Francis reminded the priests that when the Shepherd finds his lost sheep, "he doesn't hit, he doesn't scold, he takes it in his arms and embraces it and takes care of it because it was wounded." Yesterday evening I heard my first confessions and one penitent commented to the group that he avoided the sacrament because he feared being judged. He spoke to us movingly of feeling broken but too afraid to ask for help because he had a hard time trusting that he could actually be healed. (Note: I asked if I could share this anecdote with others and, since it was not within the sacramental forum, he was quite fine with it). It was amazing to watch as people physically changed through unburdening their souls and hearing the words of absolution. I didn't do anything other than allow God's infinite and reckless love and mercy reach into the depths of their hearts and bring healing and peace. By no means do I see myself as the Good Shepherd - I know that I can be a huge dirt bag! - but it was humbling to be an instrument of Christ's peace to hearts in turmoil. Fear nothing and never be afraid; and don't fret. If only your penitence fail not, God will forgive all. There is no sin, and there can be no sin on all the earth, which the Lord will not forgive to the truly repentant! Man cannot commit a sin so great as to exhaust the infinite love of God. Can there be a sin which could exceed the love of God? Think only of repentance, continual repentance, but dismiss fear altogether. Believe that God loves you as you cannot conceive; that He loves you with your sin, in your sin. It has been said of old that over one repentant sinner there is more joy in heaven than over ten righteous men. Go, and fear not. Be not bitter against men. Be not angry if you are wronged. Forgive the dead man in your heart what wrong he did you. Be reconciled with him in truth. If you are penitent, you love. And if you love you are of God. All things are atoned for, all things are saved by love. If I, a sinner, even as you are, am tender with you and have pity on you, how much more will god. Love is such a priceless treasure that you can redeem the whole world by it, and expiate not only your own sins but the sins of others. We err in thinking ourselves so grand and glorious that our sins can blot out the horizon of God's love and mercy. The mortal wound of mortal sin is the act of severing us from love, from so impoverishing our hearts and minds that we cannot even imagine that God does, or could, love us. It is a curious thing, this sacrament of confession, that by acknowledging our poverty we find within ourselves opened a path to infinite wealth. To convince others of the truth of our faith, we do not need to resort first to polemics or sharp argument. We need to let our faith be weird: to let it catch people off guard that, in our words and deeds, we witness to values not easily congruent with our society. Allow people to wonder, to grow curious, and to take the first step to "come and see" the reason we do what we do. For we do not show mercy, or embrace the wounded and margins, because we have a good argument for doing so. We show mercy because we have been offered God's love and mercy and we cannot but "Go, and do likewise." Another ordination photo: Jimmy Menkhaus, Ryan Duns, and Eric Abercrombie. Two old friends from my time at JCU!